When it comes to the career field of aviation, Black women pilots only represent less than ½ of the 1% of the total professional pilots in the industry. Currently, there are less than 150 Black women pilots in the United States holding Airline Transport Pilot, Commercial, Military, and or Certified Flight Instructor Licenses. While that number is low and needs to drastically improve, there are several Black women who have not only made their mark in the field of aviation, they have been proactively working towards increasing those numbers by giving back to the community and encouraging other Black young girls to consider becoming a part of the aviation family. 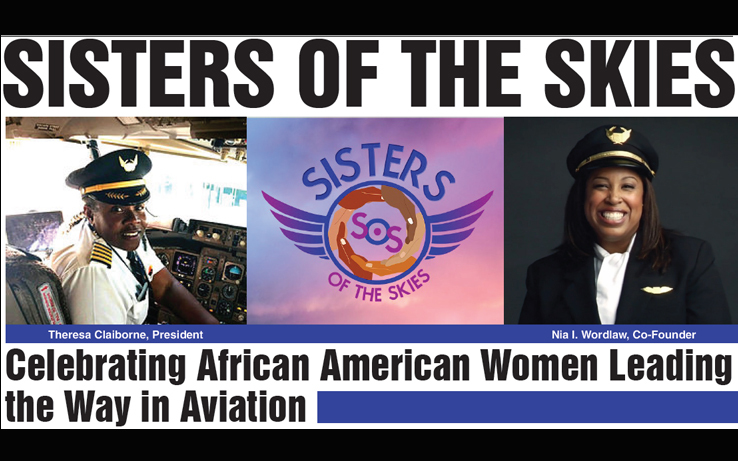 One such organization, Sisters of the Skies, was founded for that very purpose and is providing encouragement, professional development and support to countless young Black females across the country. Founded by Lieutenant Christine Angel Hughes, Sisters in the Skies provides student mentoring to college women who have had little or no exposure to professional pilot careers and demonstrate to these young Black women that professional pilot careers are attainable. Through college visits and presentations, they demonstrate to young women that professional pilot careers are attainable. They also have outreach programs geared towards students in elementary, middle and high schools and hold their annual “GIRLS ROCK WINGS” community outreach event. Two of their representatives will be in Houston on this Friday, March 23rd, to encourage, expose and recruit more Black female youth and young adults to consider the professional pilot career as a primary option for the future. Aviation trailblazers, Sisters of the Skies President and United Airlines Captain Theresa Claiborne and Sisters of the Skies Co-Founder, First Officer Nia Wordlaw, will be VIP guests and speaking at the Microsoft Store Galleria Houston Opening Day Celebration and Grand Re-Opening in the Galleria Mall at 11:00 AM on Friday. Both Claiborne and Wordlaw will be in Houston to share their stories, as well as invite the community out to their game-changing all-female flying event that will take place on April 28th at the Lone Star Flight Museum, located at 11551 Aerospace Avenue, Houston, TX 77034. The event, which is being hosted by the Dr. L.C. Carter Foundation, will include a Pilot Meet & Greet, Drone Static Display, and personalized virtual walk through youth and young adult aviation experiences. There will also be a highlighted presentation by Lone Star Flight Museum Director of Education, Kenneth Morris, who states that this historic visit is one that all African Americans should attend, especially during Women’s History Month. Wordlaw is a commercial airline pilot with over 20 years of experience in the aviation industry. As an African American female, she represents less than 1 percent of commercial airline pilots in the country. She was featured in the April 2006 edition of Ebony Magazine, the September 2015 edition of Marie Claire Magazine, and was recently featured in PBS American Masters: The Women’s List – a documentary featuring 15 trailblazers who have shaped and influenced American Culture. Wordlaw’s interest in flying began at the early age of 10, and she regularly speaks to inspire and motivate others. Wordlaw was recently awarded the 2016 Egretha Award presented annually to extraordinary African American women. Claiborne attended the University of California at Berkeley for Air Force Reserve Officer Training Corp (ROTC). On June 20, 1981 she was commissioned a 2nd Lieutenant in the United States Air Force (USAF). She attended Undergraduate Pilot Training (UPT) at Laughlin AFB, TX, and graduated on September 16, 1982, class 82-08 as the first African American female pilot in the USAF. Theresa served on active duty for seven years flying the KC-135A. She left active duty in September 1988. She continued her military career with the USAF Reserves. She served as an instructor pilot on the KC-135E and a flight commander. She rose to the rank of Lieutenant Colonel. Theresa retired from the military on January 6, 2003 with over 3000 military flight hours. While flying in the USAF Reserves, on January 15, 1990, Theresa was hired by United Airlines. She started as a flight engineer on the Boeing 727 and has since been qualified and flown the Boeing 737, 757,767, and the 747. She is currently flying as a Captain on the Boeing 757/767 and has accumulated a total of over 15,000 flight hours. Theresa is one of 15 Black female pilots at United Airlines which employees over 12,000 pilots. Ever since 1921, when Bessie Coleman was licensed in Paris, France, from the Federation Aeronautique Internationale (F.A.I. ), and subsequently received an international pilot’s license to become the first African American to do so, Black women have been following in her footsteps. Dr. Sheila Chamberlain, who is a former Army helicopter pilot, became the fifth Black female to come through the United States Army Flight School and the first African American woman Combat Intelligence Pilot. It is safe to say that Wordlaw and Claiborne have been influenced by the likes of Coleman and Chamberlain, but are now using their platform and experience to reach back and influence others to make their own history. Black women have seen a tremendous level of progress and have made many strides over the last 20 years, thanks in large part to women like Coleman, Chamberlain, Wordlaw, Claiborne, and many others paving the way. In 2002, Tahirah Lamont Brown made history as the first African American woman hired by FedEx to be a pilot. Brown first stepped into a cockpit in 1992. In 2009, Captain Rachelle Jones Kerr, First Officer Stephanie Grant and flight attendants Robin Rogers and Diana Galloway made history as the first all-Black female flight crew to ever have flown together, having done so on February 12th of that year from Atlanta to Nashville and back on Atlantic Southeast Airlines. Lieutenant La’Shanda Holmes made history in 2010, as she became the first Black female helicopter pilot in the U.S. Coast Guard. Having graduated at the top of her class in high school, Holmes joined the Coast Guard in 2003, graduated from Spelman College in 2007, graduated from Officer Candidate School in 2008 and completed flight school in 2010 at the age of 25. At her graduation in 2010, Holmes had her Wings of Gold pinned on her by Lieutenant Jeanine Menze, who not only was her inspiration, but who was the first Black female aviator in the history of the Coast Guard. In 2016, Lieutenant General Stayce D. Harris became the first Black female to achieve the rank of lieutenant general for the Air Force, after having been nominated by then-President Barack Obama and eventually being confirmed by the Senate. Harris was a trailblazer, in that after receiving her wings in 1984, she began flying C-141 transport planes at a time when women were not allowed to fly fighter planes. Prior to becoming Lieutenant General, Harris became the first Black woman to command an Air Force flying squadron and is currently the highest ranking Black female military pilot in all the U.S. armed forces. Lastly, in 2017, Delta Airlines Captain Stephanie Johnson, who is Delta’s first Black female captain in history, and First Officer Dawn Cook, made additional history as they are the first Black female cockpit crew in the history of Delta Airlines. According to Delta, on February 26th of last year, these two Black women were in the cockpit together flying an Airbus A320 from Detroit to Las Vegas. 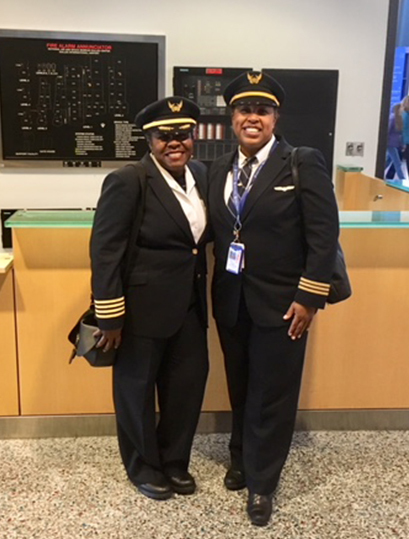 There are many other Black female aviators to highlight, but there needs to be more, which is what Claiborne and Wordlaw are hoping happens as they come to Houston to inspire a new crop of young Black females to pursue a career in aviation. For more information about Sisters of the Skies and their upcoming event on April 28th in Houston, please visit www.sistersoftheskies.org/event.